Spoof documentary following a group of computer chess programmers as they meet up to test their software against one another. The fourth feature film from the brilliant and maverick American filmmaker Andrew Bujalski, whose previous works include Funny Ha Ha (the early ‘00s film that arguably kicked-off the so-called “mumblecore” movement of American independent cinema), Mutual Appreciation (an acclaimed comic portrait of love and longing in the Brooklyn indie music scene), and Beeswax (which among its principals starred Alex Karpovsky, the filmmaker and actor who has gone on to renown for his own comedy features and his role in Lena Dunham’s Girls). A boldly intelligent ensemble comedy with a feel and atmosphere that surpass easy comparison, Computer Chess takes place in the early-1980s over the course of a weekend conference where a group of obsessive software programmers have convened to pit their latest refinements in machine-chess and the still-developing field of artificial intelligence (AI) against an assembly of human chess masters. Computer Chess is a portrait not only of the crazy and surreal relationships that come to pass between the abundance of characters who participate in the weekend event (and among whose ranks include Wiley Wiggins, the revered indie-game developer and star of Richard Linklater’s classic Dazed and Confused), but of the very era of early computing itself – and of the first, rudimentary video games – and (if that weren’t enough) of the hopes and insecurities that persisted through the film’s “retro” digital age into the present-day — that semi-virtual, hyper-social, maybe-kind-of-dehumanised landscape that, let’s face it, is our very own era. If that still weren’t enough: it’s also one of the wittiest, most shift-and-cringe-in-your-seat, and entirely LOL-hilarious movies of recent times. With its radical retro video aesthetic and wry rumination on digitality and where-we-are-today, Computer Chess is a far-reaching and ambitious benchmark for the modern American cinema. 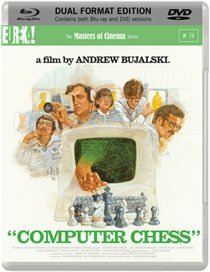 The Masters of Cinema Series is proud to present Andrew Bujalski’s Computer Chess in its UK home-viewing debut in a Dual Format (Blu-ray + DVD) release. Computer Chess transports viewers to that fleeting moment when the contest between man and machine seemed a little more up for grabs. We get to know the eccentric geniuses possessed of the vision to teach a metal box to defeat man, literally, at his own game, laying the groundwork for artificial intelligence as we know it. Released as a Dual Format (Blu-ray & DVD) edition as part of Eureka! Entertainment’s award-winning The Masters of Cinema Series on 20 January 2014. • 56-PAGE FULL-COLOUR BOOKLET featuring a new essay by Craig Keller; a discussion on retro gaming with Wiley Wiggins; a profile on cover artist (and original Atari 2600 packaging artist) Cliff Spohn; a plethora of full-colour photography from the set; and more!